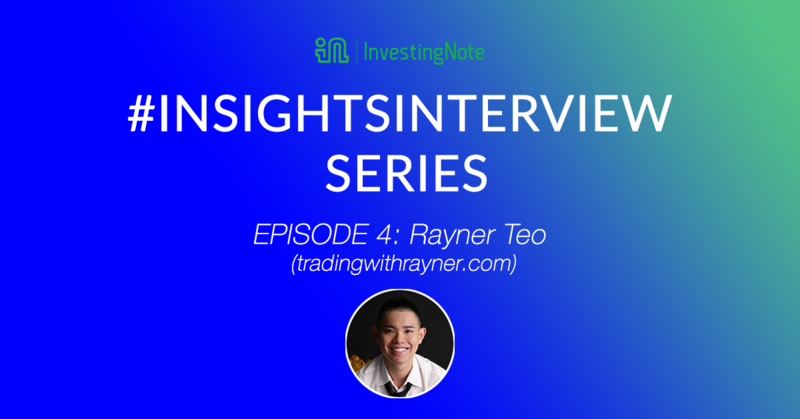 This is # InsightsInterview Episode 4 with Rayner Teo, independent trader and an ex-prop trader. He is also the founder of TradingwithRayner.com and is the most followed trader in Singapore with more than 41,000 traders reading his blog each month. This InsightsInterview series is to showcase financial experts, influencers and bloggers on a personal and insightful manner, to get glimpse of their investment journeys and their insights on the market in the near future. Every one of them have different styles of investing, expertise in different types of securities and also have their own story to tell. Previously we have launched 3 episodes of premium insights by influential bloggers, Li Guang Sheng, founder of WealthCoachAcademy, James Yeo, founder of SmallCapAsia and Terence, founder of TUBInvesting. These series of short interviews seek to understand how reputable financial experts, bloggers and influencers in the InvestingNote community think as winning investors and traders.